In the 21st century they are known as Quality Sticks but you remember them as Chocolate Cigarettes. Each pack has 10 pieces, chocolate sticks rolled in paper. Chocolate Cigarettes as they looked in the 1960s. 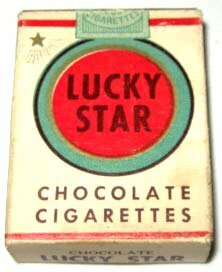 Ahh... the mere mention of chocolate cigarettes brings me back to the days when it was "cool" to have a cigarette, but we were way to young to smoke. My sisters and I would walk to the downtown (which, where we lived, was only four blocks long). Each of us had some money to spend at the candy store. Most of the time my purchase was a box of chocolate cigarettes.